Former Longhorn Myles Turner has posted a solid start to his career with the Indiana Pacers; however, Turner will be out four to six weeks with a thumb injury. Indiana Pacers rookie center Myles Turner is expected to miss four to six weeks after fracturing his left thumb, according to The Indianapolis Star. During a game against the Boston Celtics, Celtics center Kelly Olynyk guarded Turner. Turner dribbled with his back to the basket, passed the ball to teammate Monta Ellis and ran away from the action, observing his thumb. Turner told The Indianapolis Star that his thumb “was dangling a little bit” and that he convinced coach Frank Vogel to remove him from the game. “It was kind of painful,” the rookie said. The Pacers selected Turner, who played one year of college basketball at Texas, with the 11th pick of the 2015 NBA Draft. Coming off the bench, Turner’s first NBA points came from a thunderous dunk against the Grizzlies. He has continued his intensity since, averaging 7 points and one block per game before his injury. Turner leads the entire NBA in percentage of shots contested with 51.3 percent. His rim protection has anchored a defensive-minded Pacers team that ranks sixth in the NBA in points allowed per game (96.1). 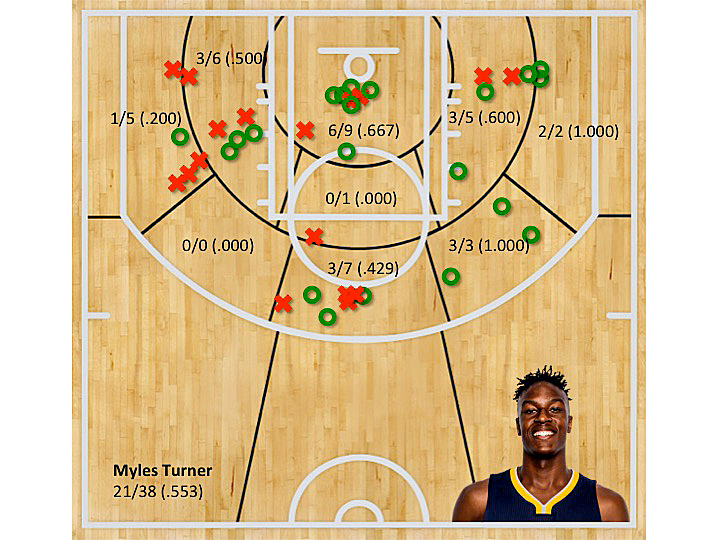 Prior to the tipoff of the 2015–16 NBA season, legendary NBA star and Pacers president Larry Bird said Myles Turner is “probably the best shooter on the team.” This compliment is not usually attributed to a center, especially one who has yet to attempt a three-point shot in his short career. But Bird’s comment hints that Turner could be a versatile weapon for the Pacers once he returns to the court. He is already shooting a very efficient 55.3 percent from the court, but a below-average 70.0 percent from the free-throw line. As he gets more minutes and exposure to the NBA, his shooting should improve, too. The Pacers lose a solid contributor to the team as Turner sits out with his thumb injury. They are currently sixth in the Eastern Conference, with a 6–4 record. According to the injury timetable, Turner should return to action by late-December. Larry Bird claims Turner is the best shooter on the Pacers. Turner is currently shooting 55.3 percent from the court this season.